King Ladislaus, like Stephen, did not have a male heir. He designated as his successor his younger nephew, Álmos, whom he found more suited to the requirements of kingship. Nevertheless, when Ladislaus died on 29 July 1095, Coloman, the elder brother of Álmos, succeeded him. Coloman seems to have had a good education but an unprepossessing appearance. He was, if we are to believe his contemporaries, ‘half blind, hunchbacked, lame and stammering’, and because of these handicaps was originally destined for an ecclesiastical career; but now he exchanged the bishop’s seat for the royal throne. A contemporary Polish chronicler says that ‘in the art of writing he was the most skilful’ of all rulers of his time, and in Hungary he was later given the epithet ‘the Learned’. Coloman tried to appease Álmos by appointing him duke, but the latter could not acquiesce in being set aside. From 1098 Álmos revolted against his brother on no fewer than five occasions, generally with German and Polish help. Finally, he was even prepared to become the vassal of Emperor Henry V if the latter could secure the Hungarian throne for him. Although for some time willing to pardon his brother, Coloman eventually lost patience and around 1113 ordered the blinding of both Álmos and his son, Béla. With the fall of Álmos the duchy as an institution fell into abeyance. Hungary proper was no longer to be divided between king and duke, and the younger members of the royal family normally governed Croatia and Dalmatia or, in the thirteenth century, Transylvania. It was early in Coloman’s reign that the first crusaders marched through Hungary. The country had been much favoured by those going to the Holy Land ever since Stephen had opened his kingdom to pilgrims in 1018 and had founded a hostelry in Jerusalem. The crusaders arrived in several waves between May and September 1096, led by Walter ‘Sans-avoir’, Peter of Amiens and Godfrey of Bouillon. Although the only troops to maintain proper discipline were Godfrey’s, the crossing of all of them was carried out without serious conflict. It was King Coloman himself who received Godfrey at Sopron, and escorted him along the left bank of the Danube to the border castle of Zemun, opposite Belgrade, while keeping his brother, Baldwin, the future king of Jerusalem, as a hostage. A few crusader bands that tried to engage in plundering were prevented from crossing the kingdom. A marauding war-band led by a Frenchman called Foucher was routed by the king himself near Nitra, while that of the German priest Gottschalk was dispersed at Székesfehérvár. Coloman also drove back the troops of Emich of Leiningen from the Hungarian border at the castle of Moson. As far as we know, the crusaders were not joined by any Hungarians. The first known pilgrim to go to Jerusalem was Duke Álmos, who undertook this long and tiring journey around 1107, between two of his revolts. It was Coloman who took the final steps towards the definitive attachment of Croatia to the Crown of Hungary. In 1097 he defeated a certain King Peter, who had emerged as a rival; then in 1102 had himself crowned king at Biograd. According to a fourteenth-century forgery, he also made a convention (pacta conventa) with the heads of the Croatian clans, in which he supposedly recognised their autonomy and specific privileges. Curiously enough, the content of the alleged pacta is concordant with reality in more than one respect. Croatia was henceforth to be ruled by the kings of Hungary, but it was given an associate status and was not incorporated into Hungary. Although, with the exception of Coloman, none of the kings was crowned in Croatia, its separate status as a kingdom (regnum) was expressed in the royal title (rex Croatiae). Moreover, Croatia was not governed by counts (ispánok), as in Hungary proper, but by a governor who exercised viceregal authority and bore the special title of ban (banus). Apart from the fact that both the ban and the members of his following were normally Hungarians, there was nothing that made Hungarian rule seem overbearing. The Croatian nobility continued to live according to their own laws and customs, and were only required to perform military service within the boundaries of their country. Although, on occasion, Hungarian noblemen were given lands in Croatia, during the later Middle Ages the contrary occurred more frequently. It is probably this particular situation that explains the absence of any serious form of Croatian separatism until the end of the Middle Ages. Coloman wished to extend a similar status to Dalmatia, his other acquisition, but this region, in contrast to Croatia, did not become a permanent part of the Hungarian Crown. Medieval Dalmatia did not constitute a country in the normal sense of the word, for the name stood not for a contiguous territory but a collection of scattered spots on the eastern coast of the Adriatic, including a few fortified towns and a number of nearby islands. Dalmatia was clearly distinguishable from Croatia by its government, its Mediterranean climate and its different culture. The towns, among which Zadar (Zara), Trogir (Trau), Šibenik (Sebenico) and Split (Spalato) were the most important, formed part of the Byzantine empire, enjoyed a broad autonomy and were governed by civic oligarchies with the archbishop or the bishop at their head. Unlike those in Croatia, the cities of Dalmatia were Italian in their outlook, and their population still spoke a Latin dialect. Coloman invaded Dalmatia in 1105, his expedition meeting with rapid success. The Emperor Alexius Comnenus, who had just asked Ladislaus’s daughter, Prisca, to be the wife of his son, the future John II, did not object to Coloman’s action, a favour that the Hungarian king later returned by helping Alexius against his Norman enemy, Bohemund. Coloman forced Zadar to surrender after a brief siege, and this resulted in all the other cities recognising his rule as well. The conditions offered by the king seem to have been acceptable. As a symbol of their recognition of his authority, Coloman demanded two-thirds of their customs revenues, but he left intact the autonomy of the cities and in 1108 confirmed their former privileges. 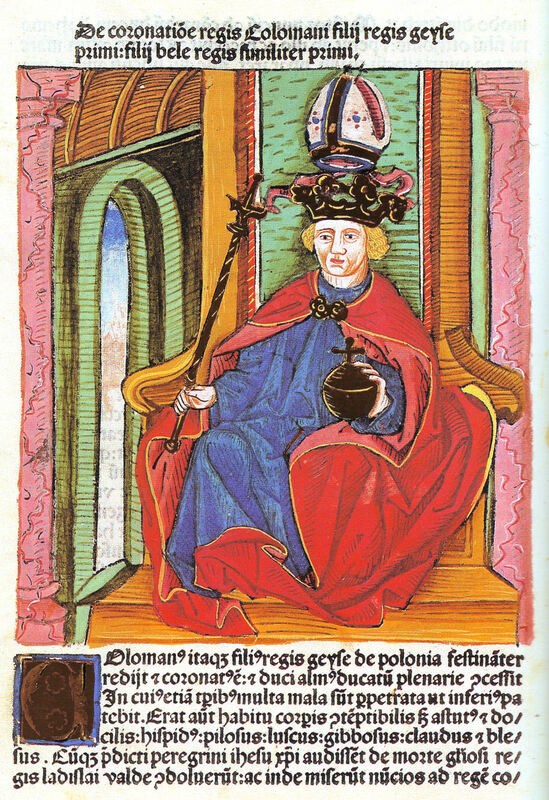 From the time of the conquest of the Adriatic coast Coloman titled himself ‘king of Hungary, Croatia and Dalmatia’ (1108), in contrast to his predecessors who had been ‘kings of the Hungarians’ (or of the ‘Pannons’). This modification of the royal title reflected important conceptual changes. On the one hand, the pagan notion of the ‘people’ (gens) was beginning to be replaced by the ‘realm’ (regnum) as the object of royal authority, which meant that the rule over persons was giving way to the rule over a territory. On the other hand, and no less importantly, the territories themselves began to be institutionalised. The annexed regions were neither actually nor conceptually incorporated into the Hungarian kingdom, but continued to be regarded as separate countries. They were politically united to Hungary first by the person, and later on by the crown, of a common king. All this meant that the regnum Hungariae was now beginning to have clear notional and territorial outlines. As in the other countries of Latin Europe, this came to be the guarantee of political stability, in contrast to other regions, where the absence of the notion of regnum resulted in less clearly defined and less durable political formations. The conquest of Croatia and Dalmatia opened a new, expansionist period in Hungarian foreign policy that was to last for about three hundred years. During the eleventh century, as we have already seen, Hungary had to face the expansionist ambitions of the Holy Roman Empire on several occasions, although these attempts never represented a real threat to the independent status of the kingdom. The country was also exposed to attacks by the nomadic tribes of the neighbouring steppe, like the Pechenegs or the Cumans. But the last raid from the east took place in 1091. Henceforth, Hungary was not to be a target of foreign invasions until the arrival of the Mongols. On the contrary, the reigns of Ladislaus and Coloman mark the beginning of a period of Hungarian expansionism that was to last until the first Ottoman incursion in 1390. During this period the Hungarian kingdom was a leading power of central Europe, which meant that, while not having to fear external attacks, it continually harassed its neighbours. Expansion was therefore the dominant feature of this period, even if it did not manifest itself in actual conquests, but rather in incessant campaigning, nominal annexations and, by these means, the continuous enlargement of the royal title. By the end of the thirteenth century the Árpádians were able to call themselves king of no fewer than eight neighbouring countries, all of which were to remain nominal parts of the Crown of Hungary until as late as 1918.